GRATUS took home some hardware at the 2019 North of the Gate Wine Competition! Please find more information about the winners here. I recently had a chance to taste through a quartet of trade sample wines from Gratus (pronounced grah-tuhs) Vineyards. Gratus Vineyards is a, new-to-me, Napa Valley winery located in Pope Valley. My detailed tasting notes are below, but I was very impressed by these alluring, vibrant and delicious wines!… Please read more here. 2017 White Blend The wine showed a golden color. Apple, pithy lemon, slate, blood orange and stone fruit were each discernible on the nose. Apple, pithy lemon, hay, slate, white peach and hints of dried apricot followed on the palate where the dried fruit was only perceptible on the finish. The wine exhibited great acidity and balance, along with good structure and length. This wine would be an ideal aperitif and would pair nicely with grilled swordfish or braised octopus. Please read more here. Please feel free to join The California Grapevine to read more. “Napa’s Gratus also contributed wines for this report. This Pope Valley project began in 2010, and the winery now produces about 600 cases per year. These wines were new to me, but I found them vibrant, delicious, and expressive… “ Please read more here. 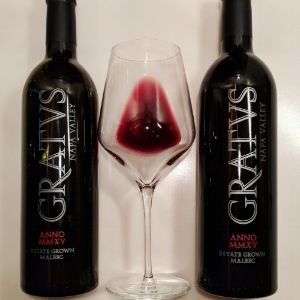 2015 Red Blend “…some great stuff from Gratus Vineyards. Notes of black cherries, black current, baking spice, savory herbs, and mocha. Good dark fruit core on the palate, with a rather gentle and soft mid-palate. Tannins are integrated well, you barely notice them with the softness of the body, and acidity gives a little freshness to finish. A good value gem coming from that will drink well over the next 10 years. Give it a decant. 92 points.” Please read and see more here. 2015 Malbec “…Deep garnet red. Spiced aromas on the nose with some peppercorn, plums and purple flowers…” Please read more here. Gratus (pronounced “grah tuhs”) Vineyards in the Pope Valley (a sub-AVA of the larger Napa Valley appellation) is a new find for me, and I am impressed. Proprietor Thomas Wargovich grew up in the eastern part of the USA and became a cardiac surgeon based in Florida. In 2001, he moved to CA, purchased a 27-acre property adjacent to Pope Creek, and planted grapes there in the Pope Valley. 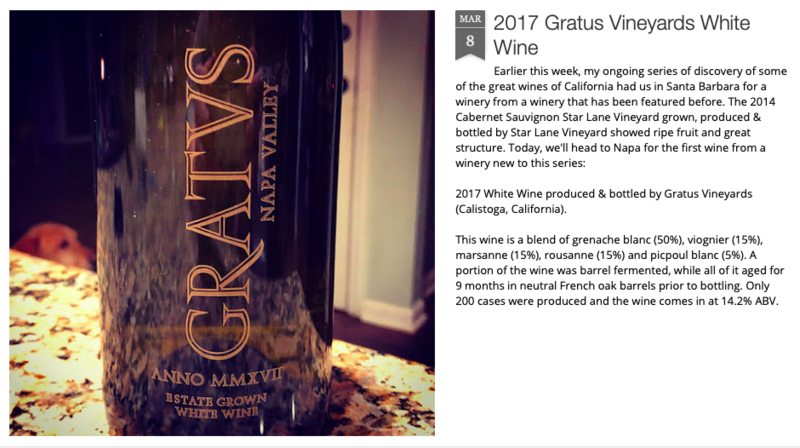 The winery name stems from the Latin word, Gratus, which means thankfulness or gratitude… Please find more of her review here. December 2018 Dark garnet in the glass, this wine smells of cherry and toffee. In the mouth, sweet cherry fruit mixes with cola and licorice notes. Decent acidity keeps the fruit bright, and a gauzy wrap of tannins surrounds the bright core. Well integrated wood doesn't poke out from the seamless whole. High-toned, but pleasant. Big heavy bottle, etched label… 14.8% alcohol. Score: between 8.5 and 9. November 2018 Located in the lee of Howell Mountain, the vineyard site is protected from fog and gets plenty of sunshine for ripening. Talented winemaker Robbie Meyer does it again, creating an expressive, dynamic red. Aromas of dark cherry and lilacs are dense— almost syrupy, but not sweet. Melted chocolate and blackberry join hands with anise and violets as the mouthfeel’s remarkable concentration paves the way for a pleasurable finish. …During our tour of the property, Wargovich and I had talked about trees, wine and the future. Gratus, Latin for grateful, is the name of their brand, but it also speaks to their being grateful for the opportunity to become a part of the Napa Valley community, grateful to have provided a place for endangered trees to thrive and grateful for the chance to play a part in Pope Valley’s growing reputation for producing excellent wines. This is a Rhône-style blend of Grenache Blanc, Viognier, Marsanne, Roussanne and Picpoul Blanc. It was aged in neutral oak for 7 months, and yet it still smells and tastes oaky. Underneath the smoky vanilla is California-ripe fruit: mango, papaya, orange, pineapple, white peach, with flowery, honeysuckle sweetness. With a medium-full body, it will appeal to Chardonnay lovers for its richness. It’s quite a flashy, elaborate wine—I can imagine it with lobster. I didn’t review a lot of Napa Valley Malbecs during my career, for the simple reason that there weren’t many. As I re-read my reviews, certain descriptors are repeated: dark, full-bodied, velvety, chocolate, blueberries, plums, meaty, peppery spices, smoky, soft tannins, dry, lingering finish. That would be a good description of this Malbec, which happens to be 100% varietal. It’s as good as any Malbec I’ve ever had, a perfect steak wine. Cabernet lovers will enjoy it. In addition to the sumptuous and frankly delicious flavors, it has the elegance, poise and finesse you expect from a Napa Valley red wine. Fans of Petite Sirah will exult in this dark, complex beauty. It has all the hallmarks of a superb young “Pet:” an inky black color except at the purple rim, an explosion of aromatics, and enormous depth. The blackberries, mulberries and chocolate are complexed with a powerful note of teriyaki-splashed animale, on both the aroma and flavor. In addition there are luscious layers of licorice, clove, cinnamon, violets, bacon and an earthy dustiness, wrapped into a wonderfully silky, velvety mouthfeel. Fifty percent of new oak, aged for 22 months, would overwhelm most red wines, even most Petite Sirahs; not this one. The wood brings subtle, judicious layers of toast, smoke, vanilla. This is seriously good wine. It is in fact one of the best Petite Sirahs I have ever tasted, and will live for decades. Years ago we used to wonder if Petite Sirah could ever come close to the elegance and finesse of a great Cabernet Sauvignon in California. This wine proves that the answer is Yes. If the wine has a fault, it is a surfeit of gorgeousness. It holds nothing back. I tasted the Malbec and Petite Sirah before this one, which is a blend of both those varieties plus 75% Cabernet Sauvignon. So what does the Cab do? Several things. It brings greater structure, in the form of firm tannins. It brings darker, blacker fruits—black plums and licorice, as well as blackberries and sweet cassis liqueur. It also brings more nobility, although that’s hard to put into words: all three red wines are elegant, but the Red Blend shows an aristocracy that the others don’t. In the end, though, all three wines—the Red Blend, Petite Sirah and Malbec—are more similar in their full-bodied, dry ripeness, softness and oakiness than different. The Red Blend is the flashiest of the trio due to Cabernet’s inherent qualities. This is a beautiful, well-articulated red wine, very much in the modern Napa style. It will please anyone with a taste for Napa Cabernet, which includes me. 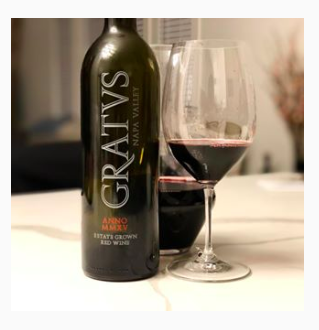 Aug 27, 2018 If you are of the mind that Petite Sirah wines are so big that you need to brace yourself before taking a sip, you have to try this Gratus (grah-tuhs) from Napa Valley. It has the deeply intense color of Petite Sirah with richly concentrated fruit, but the blackberry, spice and herb flavors glide across a palate on a super silky wave; this is pure pleasure for the tongue. Bravo to owner and vineyard manager, Thomas Wargovich, and winemaker Robbie Meyer. This Petite Sirah is all estate fruit; the vineyard lies on the eastern slopes of Howell Mountain. In addition to vineyards, the Gratus estate is an arboretum — with more than 1,000 trees; perhaps the most extensive plantings on the West Coast.